One of the early flowering varieties, the intense blues of Iris reticulata ‘Alida’ are a highlight in winter. A dwarf variety ‘Alida’ which is a sport of “Harmony”. It has attractive pale blue flowers with ‘lemon yellow’, blue and white markings on the falls. A true bulb, this miniature iris will flower from mid winter to spring depending on the climate. 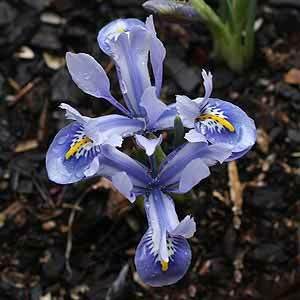 Widely grown in containers where the flowers can easily be appreciates as they emerge, Iris reticulata ‘Alida’ is also suited to the rock garden. 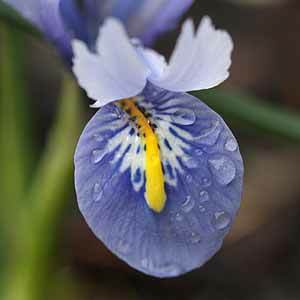 We have also seen reticulate iris naturalised into lawns, well worth a try for some added interest in winter. Said by some sources to be fragrant, we find the fragrance to be slight. Flower colour will vary a little depending on the source. Best grown in a sunny position in a humus rich well drained soil. Like all of the Reticulata Iris, ‘Alida’ really needs to go into the ground after a year or two to maintain vigour. Foliage follows the flowers and should be left until it dies right back in spring to summer. This provided the bulbs with the energy for next seasons growth. Flowers – Winter to spring pale blue petals with deeper falls marked with pale blue, yellow and white.